DEUTSCH KURZHAAR ..GSP ?? Are they not the same? I searched the forum and couldn't find any info on this. Since I'm a green horn to the breed I always wanted to know what is the difference between DEUTSCH KURZHAAR and German Shorthair Pointer. Reading the websites it seems to me is just registration and breeding titles and Evals. Similar to the German Shepherd's Pink Papers. Why do some breeders advertise DEUTSCH KURZHAAR on their websites instead of GSP? 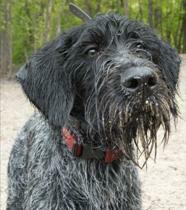 Is the DEUTSCH KURZHAAR considered a different breed compared to the GSP? I know the DEUTSCH KURZHAAR is German for German Shorthair Pointer. Re: DEUTSCH KURZHAAR ..GSP ?? Are they not the same? I think their just a "Hefty" version of what we have?? They are similar, but the registries are separate and the folks that subscribe to the breed philosophy are way different. Last edited by Cajun Casey on Thu Oct 13, 2011 7:35 pm, edited 1 time in total. I think it's the OWNERS & BREEDERS that seperate the two if you could some how leave them out of the equation they are the SAME breed. If you are on Facebook look at the DK Group. You will see quite a few pictures of pretty stout dogs and lots of dead fur, including boars. Last edited by mcbosco on Thu Oct 13, 2011 7:13 pm, edited 1 time in total. If you ask a GSP owner they will tell you they are the same. If you ask a DK owner they will tell you they are different. Yes that might be so but if you look at the German breeds I think in most instances they are heavier,thicker, & more coarse then their American counter parts but they are still them same breeds. mcbosco wrote: If you are on Facebook look at the DK Group. You will see quite a few pictures of pretty stout dogs and lots of dead fur. That is correct Brad the DKs are far surperior to the lowly bred American GSPS just ask if you don't believe or compare prices. Vonzeppelinkennels wrote: Yes that might be so but if you look at the German breeds I think in most instances they are heavier,thicker, & more coarse then their American counter parts but they are still them same breeds. Ah so just like folks say they want a German Rott..Bigger Blocky head...The bulb went off.. DDR GSD, Czech, West GSD ect. I got it now. I guess because they use the German words it got me all off track. Thanks!! My foundation dog was half DK breeding and half American field trial stock breeding. His original papers were FDSB. His grandson got favorable comments, though no placement, in his debut as an NBHA Shooting Dog. Go figure. 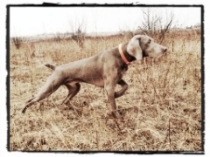 The GSP is smaller, lighter boned and bred to be a retrieving bird dog. The DK is larger on average, bigger boned and still expected to be an all rounder for the foot hunter from feather to fur. There has also been less crossbreeding with Pointers in the DK. I'm sure as soon as some DK people see this thread they will be here to straighten us all out. Adogslife?? Yes I did see a DK carrying a RedFox on the website.. that intrigues me. We have many fox in Indiana. I guess when I hit the trial circuit I will keep my eyes and ears open for a DK and see if I can pick out any differences. Do you not think a GSP could kill a fox & carry it if it's owner so allowed or trained it to do so?? I train with mostly DD and DK guys. Some of the DKs are taller/stouter, but then so is my older dog Roxi, and she's AKC. Some you wouldn't be able to tell the difference and I've been known to ask. I think stones get thrown from both sides of the fence...maybe it just depends who throws first? It's unproductive IMO, no matter which direction it comes from. I sometimes wonder if I'm looked down on, but in doing work side by side with DKs, I think my dogs prove they are capable (even though I as a trainer am often lacking)...and I've been on the receiving end of some really nice compliments by these guys that I'm sure are genuine. I think sometimes it comes down to the things people feel free to say and judge about others--without really knowing them. Once you get to know the other side, it's hard to deny that maybe their dog has just as much style on point as yours, or maybe yours can tear up a duck search just as well. I think in not having a lot of the same doggie game goals, NAVHDA might be one of the few areas, as it was for me, that meshes the two groups. I couldn't resist this summer, when the guys got out a fox, to do a fox in the box exercise. Not all dogs took to it, like a duck does to water, but I thought I'd see what my Foxy Roxi could do. After placing it in her mouth a couple times, she took off, prizing it around the barnyard like she'd just won the doggie lottery. I didn't try the retrieving from the box, as I figured that was too much to ask the 1st time round. The short answer is that the Deutsch Kurzhaar is registered with a different registration body than the GSP. 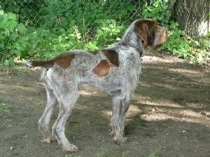 In reality, however, the Kurzhaar is truly a separate breed from the American derivative, the German Shorthaired Pointer. The Kurzhaar is bred according to a strict set of breed standards, which require testing in ability, conformation, and temperament before being allowed to breed. 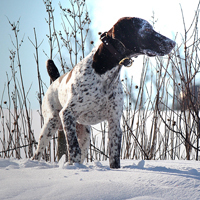 The GSP, on the other hand, as registered by the AKC, FDSB, NAVHDA and GSPCA, have only one requirement necessary before breeding—that both parents be registered members of the GSP breed. The GSP's development in the US is in the hands of individual breeders, who have a variety of interests. 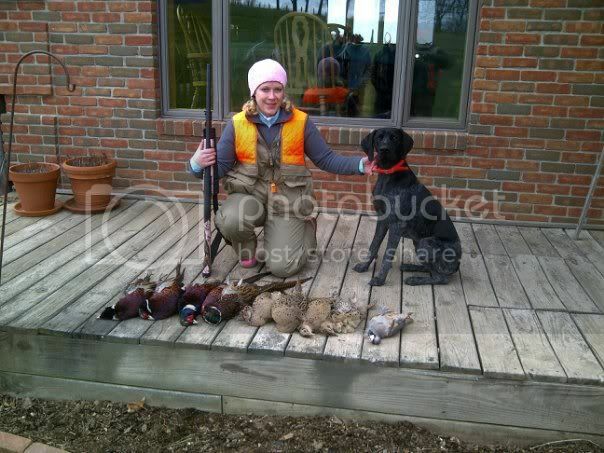 Some are hunters, some are field trialers, some are only bench show fanciers. Some breeders round out their interests, and seek a dog that fulfills all of it's intentions,—hunting and conformation, but these are in the minority. Because of the diversity of these interests, the GSP and the DK breeds have diverged considerably over the years, even though they originally descended from the same stock. To help ensure that the versatility and original functions of the breed were not lost here in the US, the North American Deutsch Kurzhaar Club (NADKC) was formed with the help of the parent club (the DKV) in Germany). Earth First, We Can Hunt The Rest Of The Planets Later. Great Pic!! I think I understand now thanks to all!!! Gotta love this site...I've been on others and by now things prob would of gotten ugly.. You folks are great!! Ok Wems you say you feel equal,ask the DK people if your GSP can take the DK test & if it passes if your GSP can be registered as a DK? The DK if they don't take the test or fail it they can be registered as AKC GSPS & in fact a DK can be registered as a GSP.But a GSP can never be registered as a DK so that's equal? Oh & like I said price a DK & GSP. Last edited by Vonzeppelinkennels on Thu Oct 13, 2011 8:00 pm, edited 2 times in total. Go to www.Desertpointkennel.com read the Bio on Lady.She is sired by a FC out of FT stock.I bred her mother Leipchen & though a solid lvr certainly not a DK. Vonzeppelinkennels wrote: Ok Wems you say you feel equal,ask the DK if your GSP can take the DK test & if it passes if your GSP can be registered as a DK? I really don't have to ask. I like and believe in what I do enough, that I don't care if my dogs can be registered as DKs. I'd have a DK if I wanted one. It would be fun to test, since I do a lot of the same stuff anyway. The guys I run with could care less about cross registering AKC, and I wonder what percentage is out there really cross registering? As was mentioned, the DK registry is a registry of records from test scores, breed shows, health clearances, etc. All dogs take the same tests and hopefully are judged in a similar fashion, with scores visible for all. AKC requires none of that. It's apples to oranges registries, so why would you expect one with a lot of requirements, to accept dogs from a registry with no requirements. So AKC dog A passes the VJP, HZP, VGP, whatever...it would have no ancestral history behind it...and defeat the entire purpose of their registry of record keeping. It would be like starting the DK stud books from scratch, with each AKC dog that the DK registry would theorhetically allow cross-registered. I think I see why you get along well with the DK people you think like them.No problem I like you any way but I doubt you care. I understand all of this, but the simple fact is that if you go back far enough you see KS titles on the foundation of our dog's, plain and simple. The DK breeders don't agree they think we have pointers with docked tails. This board is dominated by FT/American bred gsp folks, go ask the same question over at versatiledogs.com and you will get a similar reaction but from the other side. IMO opinion you a can get a very similar dog to a DK by looking at many of your NAVHDA bred dogs, because many NAVHDA lines are heavily influenced by DK blood. IMO there is about as much difference in NAVHDA dogs vs field trial dogs as there is DK vs GSP. Also remember that in some cases the only difference in a DK and a GSP is one generation. Some folks want a gsp to look and act like a gsp, some folks want a gsp to look and act like a pointer, good thing there is room enough for all of us. 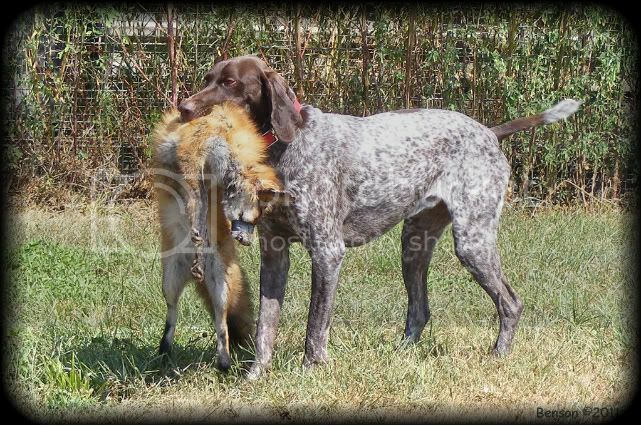 Regardless of what look you like you can find a GSP/DK that will hunt whatever you want to hunt. Andy I have said this before I have nothing against DKs as far as I'm concerned they are GSPS but the owners & breeders are high & mighty they think their DKs are worth twice as much.The only thing that makes them a DK is a test & piece of paper so why couldn't a GSP pass that test & get that piece of paperI really don't know any one that wants to but I'm just saying that's ALL they can hold above us. I know atleast one person on this board enquired about buying a DK from a litter & wanted to reg it as a GSP & was told absolutely not by the breeder.Then he politely told them where to go!! Vonzeppelinkennels wrote: Andy I have said this before I have nothing against DKs as far as I'm concerned they are GSPS but the owners & breeders are high & mighty they think their DKs are worth twice as much.The only thing that makes them a DK is a test & piece of paper so why couldn't a GSP pass that test & get that piece of paperI really don't know any one that wants to but I'm just saying that's ALL they can hold above us. I do think the DK people do a much better job on health/conformation than many/most of GSP breeders, and they are more oriented on a singular goal, as opposed to GSP where you have many branches of the breed... AF dogs, AKC FT dogs, Navhda dogs, AKC hunt test dogs, Dual dogs. (Of course some of these dogs could be successful in all or at least multiple venus). Not to mention the show garbage. There you have it folks that makes a DK worth twice as much as a GSP & my white dog only weighs about 45 lbs!! JKP tell me how big a dog does it take to kill a fox,bobcat,or pig for that matter? Many breeds have multiple registries and sometimes the breeders involved become so divided that factions cannot see the same road for the breed. This has happened recently in Border collies, with some folks favoring and following the road to the AKC conformation and performance varieties of the breed and some remaining "true" to the working stockdogs of the ABCA. The Jack Russell terrier joined the AKC, then became the Parson Russell while the JRTCA folks withdrew their support of those affiliated with the AKC and took the name of the breed with them. Other dogs with divergent processes that resulted in splitting a breed include the Irish and the red setters and Staffordshire and American pit bull terriers. As far as DKs adhering to some ancestral developmental standard through testing, the German shorthaired pointer began to be developed in the late nineteenth century and the pinnacle of testing, the Kleeman Sieger, was developed in the mid-twentieth, after the breed had been established in America. Same reason I don't own a DK, my dog my rules. But I do admire the singular focus and importance given to health. Is that focus why they still have issues with VWD and American dogs seldom do? 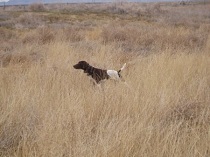 Probably the pointer infusion has reduced the occurrence in our American bred dogs. And is that really a bad thing, in the long run? Ever seen a dog bleed out from VWDII? But, that's beside the point. 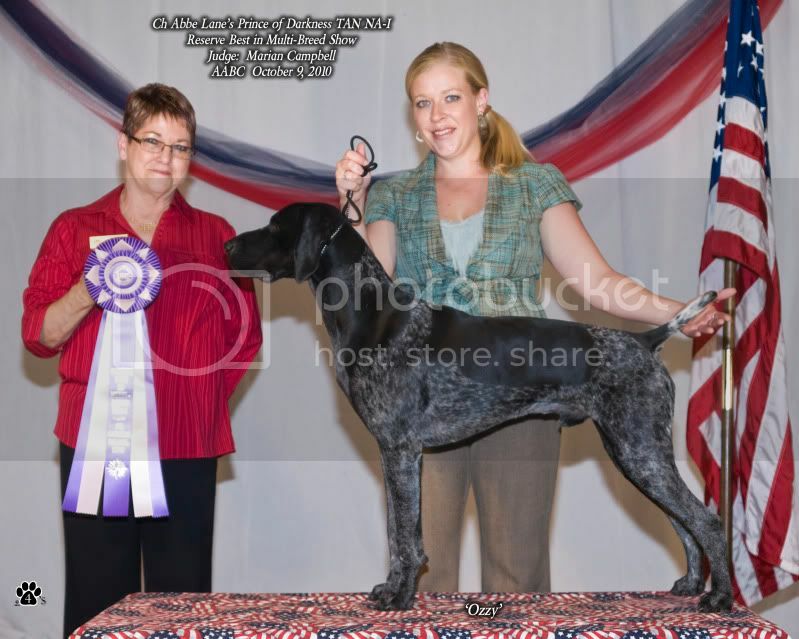 All DKs are German shorthaired pointers, but not all German shorthaired pointers are DKs. I'm down with that. WOW, some of you are way off base. VWD? Can someone name one DK who has this? how big a dog does it take to kill a fox,bobcat,or pig for that matter? DKs don't take down bobcat or pigs or any big game. Fox are small and I expect my DKs to take down coyote, which on average are 40lbs. I have nothing against DKs as far as I'm concerned they are GSPS but the owners & breeders are high & mighty they think their DKs are worth twice as much.The only thing that makes them a DK is a test & piece of paper so why couldn't a GSP pass that test & get that piece of paperI really don't know any one that wants to but I'm just saying that's ALL they can hold above us. Did I mention you have no idea what you are talking about? Oh,yeah, I did. Before you speak learn the facts. Ok dogslife you give the facts since WE don't know anything.I'm going deer hunting for couple weeks so have to wait till I get back to LEARN!! I told you we were full of crap.Lets here from the ALMIGHTY!! Who said they were Arrogant? OH I think it was me. Why do you use the word "von" in your kennel name and do you own dogs with DK in the pedigree? Thanks for stating this, from reading the content of your posts it is not obvious. The way I see it is genetically, they are the same breed, however, it sounds like the lines have been taken in slightly different direction resulting in slightly different characteristics. What I'm confused about is why GSPS breeders are bitter about DK's being sold at a higher price. There is obviously a demand for that philosophy of breeding, whether or not you agree with it, it's there and DK pups are sold at a higher price. If you're really that torn up about it, stop complaining and change your business model and breed some DKS! Personally I would never buy a DK or DD over a GSP or GWP because I think I can get a great, healthy, hunting dog for much cheaper with the other breeds, but am I going to tell the guy next door who wants to spend that extra cash on a DK he's stupid for doing so and he's got another think coming if he thinks his dog is superior to mine because he spent more money on it? No, that's ridiculous. They obviously believe buying a DK will produce a better dog, that's fine. You think it won't. Who cares? and if you do care, prove it in the field if that will make you feel better. It just seems like the main issue is the price point of these dogs and arguing over that IMO is just silly. In my mind they are the same breed, maybe different types. The potential issue I see with DK's in the US is that unless they continuously import, the gene pool is going to shrink and shrink, which is not good for any breed. I'm all about genetic diversity. I don't like that they will dual register with AKC but it only works one way. Even if my GSP passed all of their health tests and hunting tests he's still not good enough? That's an elitist attitude that I'm not real crazy about. I've seen some really nice DK's, but I've also seen some that look like hounds. And for all their health testing, I've heard of dysplasia cropping up with them as well. ACooper wrote: I do think the DK people do a much better job on health/conformation than many/most of GSP breeders, and they are more oriented on a singular goal, as opposed to GSP where you have many branches of the breed... AF dogs, AKC FT dogs, Navhda dogs, AKC hunt test dogs, Dual dogs. (Of course some of these dogs could be successful in all or at least multiple venus). Not to mention the show garbage. Hey now, not all dogs that show are "show garbage." I really like the UKC philosophy of the "Total Dog"......dogs that excel in performance and are conformationally correct to get the job done. I'm trying to achieve that with my GSP. He's a show CH, got his UKC Natural Ability, Prize I in NAVHDA NA, and got his Started Hunting Retriever title. I don't think focusing solely on conformation is a good thing for any breed; I want a dog that can do what he was bred to do, but having something nice to look at in the field isn't a bad thing either. Atleast one person understands where I'm coming from.Dogslife I'm sure theire are DKs in my peds somewhere since that where it all started but you know me.So INFORM me with some of that education or FACTS. I really don't care if they get 4 times as much but I've heard so much from the breeders how much more superior they are to the Lowly American bred GSPS etc.etc. They can do nothing an A Bred GSP can't do except be registered as a DK!!!!!!!!!!!!!!!!!!!!!!!!!!!!!!!!!!!!!!!!!!!!!!! HAHA! Not many DKs are sold at higher prices,generally around $800 -$1,000. Is anyone guarenteed to get a better dog, that would depend on the individuals definition of better. The DK gene pool in America is smaller than desired due to some breeders not wanting to breed outside a certain line. Going to Germany for breeding or importing dogs is a huge plus not to be seen as a disadvantage for the breed. As was mentioned, the DK registry is a registry of records from test scores, breed shows, health clearances, etc. All dogs take the same tests and hopefully are judged in a similar fashion, with scores visible for all. AKC requires none of that. It's apples to oranges registries, so why would you expect one with a lot of requirements, to accept dogs from a registry with no requirements. So AKC dog A passes the VJP, HZP, VGP, whatever...it would have no ancestral history behind it...and defeat the entire purpose of their registry of record keeping. It would be like starting the DK stud books from scratch, with each AKC dog that the DK registry would theorhetically allow cross-registered. The bottom line is, DK breeders,any German club,is about like-minded individauls with a similiar goal. So give me the facts where I was wrong,I'm still waiting & I'm waiting on my wife to get here with the dog food so I can mix it & go.I use VON because this is AMERICA & I can use any darn thing I please & breed anything I please. legallyblonde wrote: In my mind they are the same breed, maybe different types. The potential issue I see with DK's in the US is that unless they continuously import, the gene pool is going to shrink and shrink, which is not good for any breed. I'm all about genetic diversity. I don't like that they will dual register with AKC but it only works one way. Even if my GSP passed all of their health tests and hunting tests he's still not good enough? That's an elitist attitude that I'm not real crazy about. I've seen some really nice DK's, but I've also seen some that look like hounds. And for all their health testing, I've heard of dysplasia cropping up with them as well. Speaking of GSD's, that's another reason I like the UKC show ring, you actually see working dogs getting put up. I've seen plenty of judges put up WORKING LINE GSD's over those awful broken down triangles that people call GSD's. Ok I'm done feeding my dogs but Adogslife I'm looking forward to LEARNING so put all that INFO & FACTS up here so I can LAERN when I get home. Bye I'm East bound & down! Enjoy Folks.